I shared some of my favorite fall drinks last October, & even though we're hitting the tail-end of summer (! ), I figured, why not share my favorite drinks for this season, too? 'Tis the season for all things refreshing! First things first, beer. 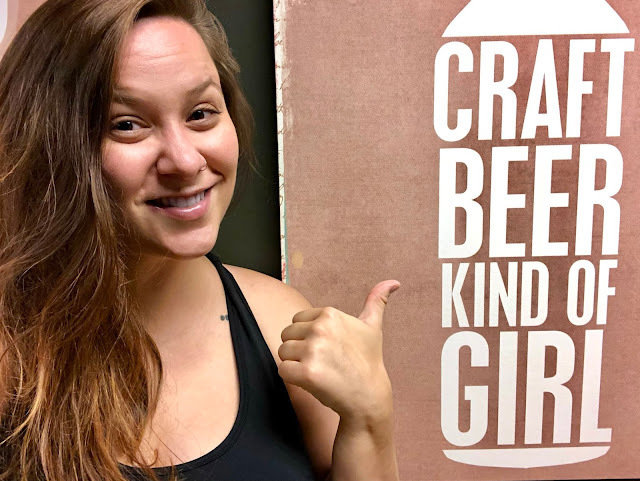 I used to be a Miller-Lite-only kinda gal, but shortly after turning 30, I finally figured out what kind of craft beers I like (no hops ever), & life is so much better because of it. Some of my locally brewed favorites are: Holy Moses White Ale from Great Lakes Brewing Co.; Space Force Saison from Sibling Revelry Brewery; Rosellini from Platform Beer Co.; & the Habituale Kölsch from Saucy Brew Works... to name a few! You might think hot tea is best left to the colder months, but I say: What could be more summery than a mug full of flowers? Teabloom's little ball-shaped bundles come in all different flavors, & when you pour hot water over them, they literally bloom into your mug. You let the tea steep for five to 10 minutes, & you've got a fresh mug of flower-filled tea! I'm working my way through a canister of their Flowering Fruit Teas, with my faves so far being the peach & the acai berry. This is definitely a love that will carry over into fall & winter, too. I'm not much of a cocktail gal, but every once in awhile, I go in for something sweet. Of particular note are the passionfruit caipiroska I had on our honeymoon & the Phuket Sunset I had from Ty Fun a couple weeks ago. My favorite time to have a cocktail is on the beach (a rarity) or while sitting alone on a patio with a good book (much more common). Someday I'll be a drinker of black coffee, but for now, my favorite way to drink it is lightly sweetened & with just a liiiittle bit of soy milk. It seems like these days, the fancier coffeeshops don't have soy milk, & I just don't like the other faux-milk options as much. Coconut milk tastes like sunscreen, almond milk upsets my stomach, macadamia nut milk is bitter, oat milk is heavy... gimme my damn soy milk, please. Like tea, mead may seem to be a heavy, cozy, cold-months-only kind of drink, but some of the lighter flavors are perfect for summer. Come winter, I'll switch to a heavier variety, but this flavor, in particular, is my favorite summer sipper, almost like a light wine. It's best drunk on my home patio, just watching the world go by. PSA: I also drink a ton of water in the summer (& all year round), as should you. That said, I need to get a water filter; my mom's aversion to tap water has made me paranoid! What's your favorite summer drink? Anything I need to try? Disclaimer: Thanks to Teabloom for sponsoring this post. I was provided a canister of teas of my choice in exchange for an honest review. As always, all views are my own. Thank you for supporting the brands that support this blog!